Issue 51 is dedicated to Will Savage, one of our submissions editors, who passed away suddenly while this issue was in production. Carrie was born inside a house made from a riverboat that had caught fire and was brought ashore. Moving from her early and detailed memories of magical New Orleans to rural Colorado when school began, she worked to save up money and escape the incomprehensibly boring place. She traveled the world exploring art museums and pondering ancient civilizations. Years of experimentation later, Carrie became enraged by a world where it seemed all the great paintings were painted and nothing new remained to add. Out of this egregious dissatisfaction, she attacked her library of art books, mercilessly tearing off their spines and releasing the pages from their bindings. Out of this sea of pictured paper she cut new characters for herself and stuck them on to other painting’s backgrounds, repainting these collaged articles into new masterpieces that she found far more entertaining than the old paintings from which they came. 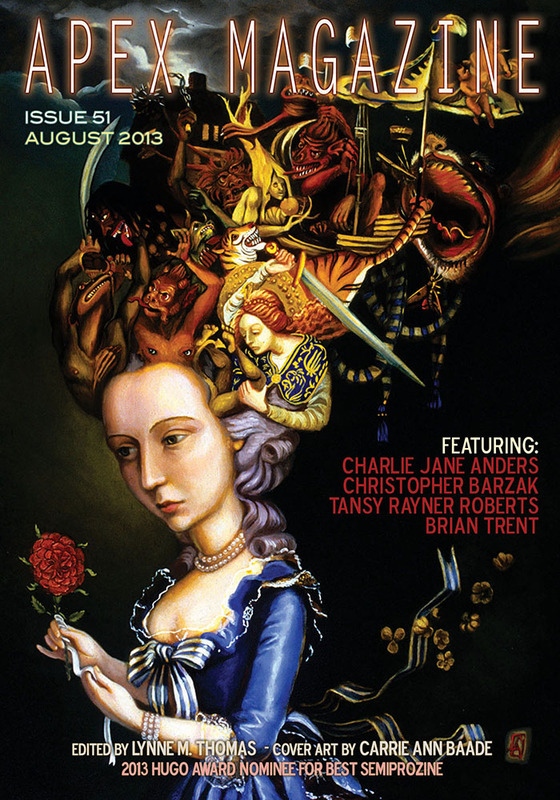 Carrie Ann Baade was awarded the Florida Division of Cultural Affairs Individual Artist Fellowship in 2010, the Delaware Division of the Arts Fellowship for Established Artist in 2005, and was nominated for the prestigious United States Artist Fellowship in 2006 and the Joan Mitchell Grant in 2012. Her work has been exhibited in museums and galleries nationally and internationally, including recent solo exhibitions: the Museum of Contemporary Art in Jacksonville Florida, the Delaware Center for Contemporary Art, the Rosenfeld Gallery in Philadelphia, Billy Shire Fine Arts in Los Angeles, and the Ningbo Art Museum in China. She received her BFA from the School of the Art Institute of Chicago and her masters from University of Delaware. Currently, Carrie lives and works in Tallahassee where she is an Associate Professor of Art at Florida State University where she teaches the materials and techniques of the old masters.